I am extremely happy to be hosting my first My Blog Spark giveaway! This giveaway is brought to you by both Yoplait and My Blog Spark. I love Yoplait yogurt, but I had never tried Greek Yogurt before this. I bought a cup of Blueberry and a cup of the Honey Vanilla with my VIP coupons. The first thing I noticed was the health benefits. 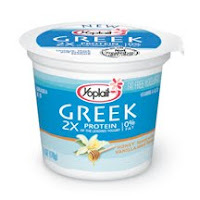 Yoplait Greek Yogurt has 2x the amount of protein of the leading yogurt and 0% fat. I could always use more Protein in my diet since I normally only eat meat at most once a day. It also contains Vitamin A, Calcium, Vitamin D, Phosphorus and it is Gluten Free. Another thing I noticed at first glance was the size of the yogurt cups. Yoplait Greek Yogurt comes in a 6oz cup. Then it was time to taste the yogurt. I started with the Honey Vanilla. I was expecting it to tasted like regular yogurt, and it doesn't. Therefore, I was a little put off by the taste at first. Then, the more I ate it, the more I liked it. I personally liked the Blueberry a lot more. The Blueberry had a stronger, slightly sweeter taste. Overall, I came to the conclusion that Greek Yogurt is just not my thing. I still may eat it occasionally for health benefits, but I prefer regular Yoplait. One lucky winner will win a "Nourish Your Inner Goddess" gift pack from Yoplait and My Blog Spark. This includes 2 VIP coupons for free Yoplait Greek Yogurt, a robe, slippers and other spa goodies (see picture at top of post). Tell me which flavor you would like to try (please note that this giveaway excludes certain states due to their dairy laws). @Latsyrc728 has a Yoplait Greek Yogurt Nourish Your Inner Goddess #Giveaway http://goo.gl/fb/2uFr #win #contest (ends 04/19) Please RT! Giveaway ends 4/19/10 at 9pm EST. Giveaway is for US (excluding California, Idaho, Louisiana, Minnesota, Nevada, New Jersey, North Dakota, and Tennessee) residents only. No P.O. Boxes. Winner will be chosen randomly. Winner will be contacted via e-mail and then will have 48 hours to respond before a new winner will be chosen. Oh I would so love to try the Honey Vanilla. I love those two flavors and together I bet they are great. I am a follower on Google friends. I would love to try the blueberry! I really need to boost my protein, we're in our third trimester! I'd like to try blueberry flavor. I wanted to try the Honey Vanilla, but if you liked Blueberry better, I will go with that one!!! sohamolina FB fan of Yoplait. I think I would like strawberry the best but given the fact you liked the blueberry best I would probably try it out also. I would love to try the honey vanilla! I'd love to try the Honey Vanilla! I want to try Honey Vanilla.